With its firm, oil-rich flesh and rich, creamy flavor, Mackerel is a superb species of fish for Sashimi. The intense, complex flavors act as a wonderful compliment to delicate Japanese sauces, and because of the high concentration of fatty acids, there are myriad of health benefits to be had from incorporating Mackerel into your diet. But, as with any type of fish used in Japanese cooking, it’s important to know how to select, cut and grade your fish to reap both the health and flavorful benefits. Mackerel is high in fatty acids, and as such, has a tendency to spoil very quickly in comparison to other dark fleshed fish. It is therefore important to know the typical signs of freshness to look for when selecting Mackerel for Sashimi, or any other recipe. One of the key things to look at when buying a fresh fish is its eyes. A fresh Mackerel will usually have dark, jet black pupils which still appear glossy to the eye. Another characteristic to look for is eye plumpness, which can be done by turning the fish on its side. The eye of a fresh Mackerel will usually still be slightly convex and plump. Like the eyes, the skin of the fish should ideally be glossy and shiny, with a degree of elasticity when pressed with your finger. If the skin shows the embedded print of your finger, the fish is not really suitable for use. The scent of the Mackerel is another key characteristic that can help to determine its freshness. A fresh Mackerel will smell like the sea, whereas a fish past its best will exude a fishy, pungent aroma. Finally, take a look at the gills of the fish by gently lifting them up on either side. Bright red flesh is indicative of the fish being fresh, whereas a brownish-red or dull color means the fish has likely been exposed to the air too long (ie. left out, or not refrigerated to retain freshness). cut behind the pectoral fin on the other side of the fish. Next, make a deep cut on the bottommost part of the fish on either side. Both cuts should meet at a small point on the underside of the fish, effectively detaching the head area from the body – apart from the skin and flesh holding it in place at the very top. From the point where both cuts meet, run the tip of your blade in a straight line down the underbelly of the fish, taking care not to perforate the intestines as you go. pulling the innards and intestines out from the body through the cut in the underbelly. This is the simplest and cleanest way of gutting the fish in one swift movement. Wash the body of the fish thoroughly under a tap, ensuring you get rid of any residual fluid and blood from within the fish. Continuing from where you left off at the fish’s underbelly, glide the tip of the knife through the fish until you reach the tail portion. 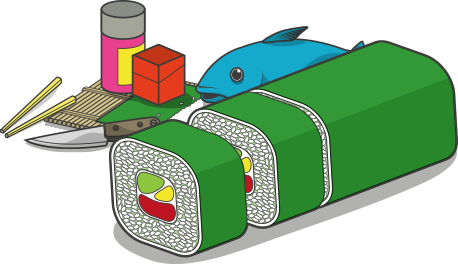 Next, roll the fish over so that the top of the fish is facing away from you. Align your blade with the fin at the top rear of the fish, then cut in and along using gentle slicing motions. You should be able to hear the tip of the knife gliding along the ridges of the spine. At the narrowest point of the tail, angle your blade vertically toward the body of the fish. Gently slice through the flesh along the lower body, holding it down as you bring the knife along the side of the spine. This separates one filet from the body of the fish. Turn the piece of fish containing the spine over onto the cut side, and repeat the cutting process from the narrowest point of the tail to separate the spine from the flesh. Finally, reposition your knife at the narrowest point of the tail, and allow the blade to glide through the flesh horizontally, completely separating the filet from the spine. Despite separating the Mackerel filets from the spine, both sides will still have the ribs intact. To remove them, position your blade between the ribs and the flesh at the center of the filet. Using a gentle slicing motion, begin to cut through the flesh to separate the ribs from the meat. Repeat for the second filet. To remove the remaining bones, you will need a pair of flat-ended tweezers. Starting from the widest end of the filet, gently pull each one upward and out of the flesh using the tweezers. You will be able to feel any missed bones by running your finger along the central line of the filet. Removing the skin of the Mackerel is easy. Simply peel up the outer layer of skin using your fingers, starting at the tail end. Then, pull the skin away from yourself along the body of the fish – it should come away as easily as cling-film. Repeat for the second filet. 4ºF (-20ºC) or below for 7 days. 31ºF (-35ºC) or below for 15 hours. freeze till solid at -31ºF (-35ºC) or below, and then store at -4ºF (-20ºC) or below for another 24 hours prior to use. These freezing guidelines are only applicable to fish which are less than 6 inches (approx. 15 cm in thick). It’s generally not advised to freeze larger fish, as you cannot be sure that all parasites will be destroyed by the freezing process. To cure the Mackerel, sprinkle a generous helping of salt over the flesh of each filet. Leave covered for 30-60 minutes, then rinse under cold water, and pat each filet dry. Next, pour half a liter of rice wine vinegar into a flat bottomed container large enough to hold the filets. Add roughly 2 tbsp of Mirin to the rice wine vinegar, followed by 3 tbsp of sugar and 2 tsp of salt. Mix together until the sugar dissolves, then place both filets (flesh side down) into the container. Cover and leave to marinade in the fridge for approximately 24 hours. Starting at the tail end, position your knife at a 25 degree angle against the flesh, roughly 1 inch from the end of the fish. Use your other hand to hold the fish as you make the first cut. The knife should be sharp enough that it glides through the flesh effortlessly. Repeat this to make further slices. As a rule of thumb, they should be just a few millimeters in thickness – not quite wafer thin, just thick enough that you cannot see the blade through the slice when cutting. Arrange the pre-cut Sashimi in a row on your chopping board, one overlapping the next like fallen dominoes. Using your knife, and your hand to keep them steady, lift the entire row and position on your plate. For contrast, you might like to place one row facing one way, shiny side up, and the second row slightly atop the first (flesh side up), facing the opposite direction. Arrange a bed of cucumber spiral garnish on the other side of the plate, using your fingers to spread it out for even coverage. Next, position two cucumber fans atop the spiral bed with the dark green skin facing the fish. Add a pinch of pickled ginger and a piece of Wasabi for contrast. Serve with chopsticks, and a bowl of soy sauce for dipping.